Brave is hands-down the most visually stunning animation that Pixar has ever produced. The lead character is the Scottish princess Merida (voiced by Kelly McDonald), who has a free spirit and doesn't like the whole princess training (kind of like Jasmine in Aladdin). Finally one day her parents tell her that she has to select a suitor, and she wasn't prepared for it. She rebels and runs away from home, supposedly to find her true destiny. The events which take place after that point change the story from having one lead character to two – with the second being Merida's mother, the Queen Elinor (voiced by Emma Thompson). The plot at that point completely changes with neither character being the true lead, and doesn't completely explain what happens to have the necessary character development to wrap things up. The ending just happens with just a basic reason why it did, and that is why it was weak. I'm not sure how it could have been handled better to properly explain the character development that had to occur in order for the movie to finish like it did (other than the very basic reason). Billy Connolly adds his voice as King Fergus, Merida's father, and Merida also has three very young triplet brothers who again, don't add much to the main story. These supporting characters are used sparingly throughout the movie to drive certain aspects forward, but there is nothing special about how they are used. The 3D was exceptional however. Unlike live-action movies where you either have to shoot the entire picture with 3D cameras or create the 3D in post-production, digitally animated movies seem to be natural for the 3D experience. Brave is no exception to this, as 3D gives the movie more depth than you get in the 2D version, and is a must-have for anyone with a 3D TV for the animation in 3D alone. Unlike previous 3D releases, this one actually has a bonus feature on the 3D disc – you can see La Luna in 3D, which you can't on the other release which has that wonderful short film. But that's not all that is included in the combo pack. The combo pack includes the regular 2D Blu-Ray, with the movie, La Luna in 2D, the bonus short The Legend of Mordu, extended scenes and audio commentary. It also gives you a bonus Blu-Ray full of more featurettes, an art gallery and the alternate opening to the movie. Disney also threw in a DVD copy of the film, and a free digital copy of the film. All in all a wonderful value for everything you get. If you still haven't gotten a 3D TV yet, don't hesitate to buy the 3D combo pack now– you can still watch the 2D Blu-Ray now and watch it in gorgeous 3D when you do. The 3D treatment coupled with the value of the package pulls the entire movie up to a B for me. 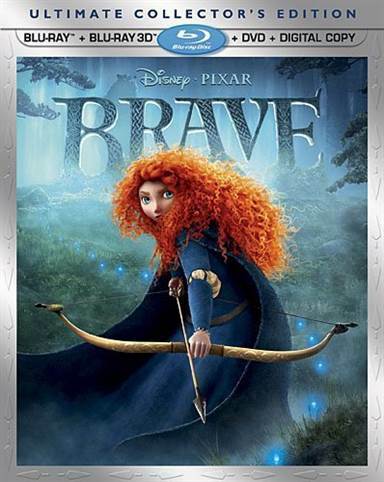 Download Brave Five-Disc Ultimate Collector's Edition from the iTunes Store in Digial HD. For more information about Brave visit the FlickDirect Movie Database.